Arthur and Maudie are twins, they are Brightstorms, their father a famous explorer. He has died in an attempt to be the first at South Polaris and evidence suggests he was involved in criminal activities. His reputation is ruined; the Brightstorm name degraded. Arthur and Maudie determine to find the truth and restore the family fortunes. In the company of the butler, Forbes and Harriet Culpeper with her flying ship, the Aurora they set off on a race to reach the Polaris. They are embarking on a journey that will see them facing real and terrible danger. But will they succeed? Lively storytelling, an attractive cast with interesting characters – Maudie is the genius engineer, Arthur, despite having lost an arm, the imaginative thinker, while Harriet Culpeper brings energy and optimism – these combine to draw the reader in ensuring pages are turned. The villains are suitably wicked and duplicitous; Eudora Vane might be a relative of Cruella de Vil. The setting is imaginative. Here is a world that is recognisable in many respects but one that can accommodate sky ships, sapient creatures and enormous telepathic wolves. Society is dominated by explorer families intent on taming the unknown – to its detriment. 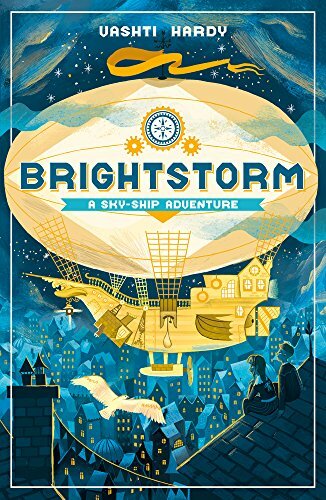 Well crafted, full of humour, excitement and jeopardy, Brightstorm is a welcome debut for that KS2 audience. Vashti Hardy is a talent to watch and I look forward to meeting Arthur and Maudie and friends in future adventures.